With a new, functional wooden case. This is really a discussion of aesthetics. The plastic case was useful to me – that is, by any objective measure, it did all that I needed it to do. 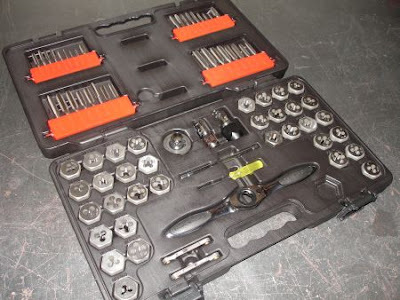 It closed tightly, held each tap and die separately and securely, and was tough and durable. In fact, I think I could argue that measured only objectively, it would surpass the utility of the wooden case, being more durable and accepting of physical abuse. However, subjectively, in terms of being aesthetically pleasing to me, it failed miserably. There is a school of thought (championed by architect Louis Sullivan) that “form ever follows function.” I interpret this to mean that the function of an object is of primary importance, and its appearance or form is of secondary importance, and driven by the function. Objective trumps subjective. The plastic case fits this ideal – the way it looked was determined by what it was being asked to do namely, protect the contents. However, what if I expand the notion of function, of what I am asking it to do; to include being aesthetically pleasing to look at, touch or smell? I mean, come on, I am going to be spending precious shop time with this thing - what if I want more than mere utility? What if the job of the case is to both protect the contents and do so with some degree of beauty? I guess this would change the statement to “form is function” or at least “function is at least partially composed of form” or maybe “Form’N’Function BFF” or something like that. In The Nature and Aesthetics of Design, architect (and wood worker) David Pye wrote: “It seems to be difficult for people in our day to accept the fact that the subjective results of design are ultimately as important as any objective ones can usually be and that they are indeed necessary to anything worth calling life.” I think what he is getting at here, is that we humans are not robots. We have, and should nurture, a soul. And the soul craves art and beauty as much as the mind craves function and utility. 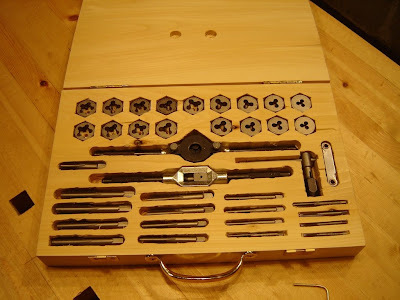 So, I guess this is how I would explain it: Why did I make a new, wooden case for the tap and die set? Because it made my soul happy – that’s why. Now, why did I do it with hand tools only? Ahhh… well… same answer actually. Yeah, I know, it's not perfect. I've been sniped more times than I can remember (Live by the sword...), overcharged for "handling", charged more for shipping to Alaska (in a USPS Flat Rate box! ), told that shipping to Alaska was unavailable because they would only ship USPS (49th STATE people! ), frustrated by lousy pictures, and annoyed, very annoyed at the crazy amounts some people will pay for items, thus driving the prices ever upward. Did anyone besides me notice the 4 vol. set of Audels going for $300 plus!? And it sure didn't look like the first edition either, rather the 1940's edition to boot! Crazy! But for me, in the Old Tool Hell of the North, it's just about the only way I ever get tools short of traveling back east. I don't really know how many tools I have, but I can count on a single hand the one's I've scored locally. Okay, one local purchase was 30 wooden moulding planes that pretty much fell from the sky, but other than that, it is slim, slim, slim pickin's up here. Which is why I spend so much time on eBay. And sometimes it pays off. Today I opened a box with a nice set of Russell Jennings bits and felt the satisfaction of having made a good purchase and added to my kit. Yep, despite all its annoying qualities, I do love eBay. I just want to celebrate that Roy Underhill (reverently referred to by many hand tool enthusiasts as "Saint Roy") is coming out with a new book! Yes! His last book, The Woodwright's Apprentice was published in 1996, so it has been much too long! 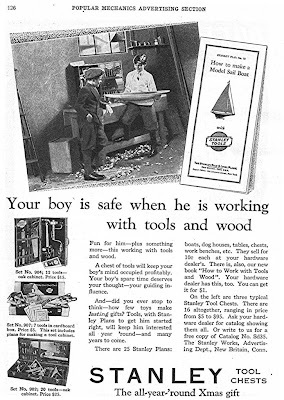 The new book is titled The Woodwright's Guide: Working Wood with Wedge and Edge. It looks like it will be available in November. I can't wait! Details on the new book are available at the University of North Carolina Press website. If you have seen my library link, you have probably figured out that I love books. Well, I can honestly say that Roy's books are my all-time favorites. If you have never read Roy's books, you are missing out on the best of the best! Seriously, I have read them all multiple times and continue to enjoy and learn from them. If you ever have the chance to see Roy live - do it! 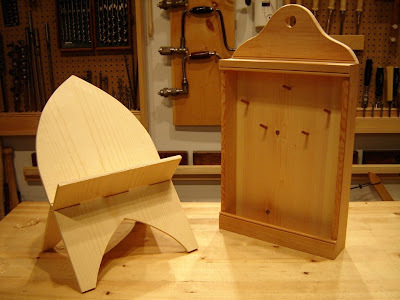 I was lucky enough to spend three days listening, watching and learning from Roy at a seminar in Anchorage and my woodworking has never been the same again. Einstein was right - time is not constant. My shop demonstrates this to me on a regular basis - "I'll just work on this for 15 minutes!" and then "What?! I've been in the shop for 2 hours?" 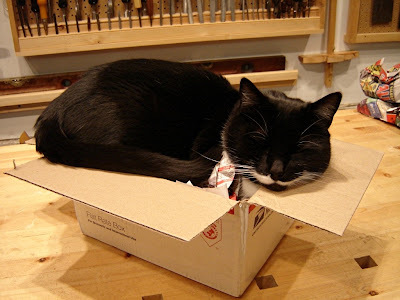 Of course, I'm not complaining - I love being in my shop. I'm just always amazed, and a little confused, at how it happens. 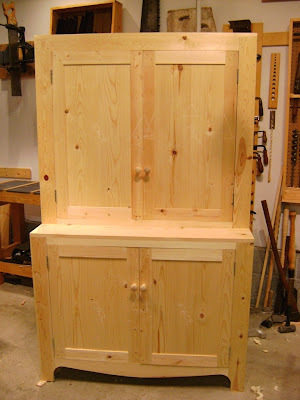 I am finally starting to believe that the Shaker cabinet might, just might, be finished before my son starts crawling. Today's job was to start making the molding for the top and the step-back. In a remarkably sensible move, I decided that there wasn't enough time to finish - I'd just rip the strips, clean them up with a plane, and stop. "Should take about 15 minutes." First - find the board I am going to rip. Okay, there it is - half-way down in the center of a stickered pile. Sigh. Well, nothing for it, start moving wood. Unpile. Pick. Pile. Not too bad. Put board on bench. 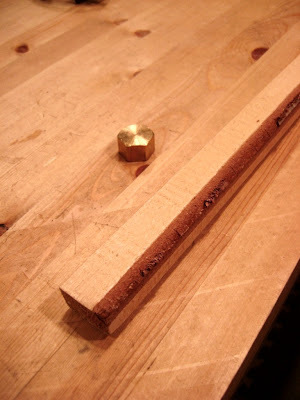 Set marking gauge and mark off two strips, one on each edge. Flip. Repeat. Done. Move board to saw bench. Grab rip saw from till. Start to cut. What? When did this thing get so dull? Oh...probably when I was ripping the bamboo flooring...with its "scratch resistant" coating...probably "saw resistant" too. Hmm. Okay. 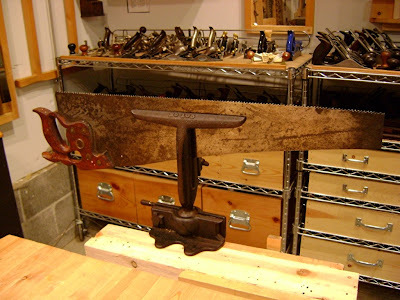 Get saw vise. Put piece of 2x4 in bench vise. 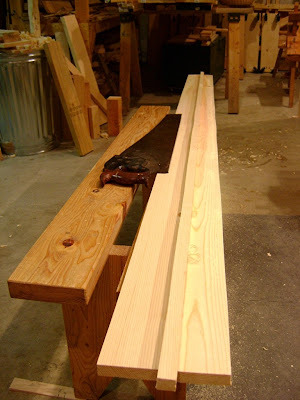 Clamp saw vise to 2x4. Clamp saw in saw vise. Get file - the one with the handle so I don't hurt myself. Oh. That one is too small. Hmm. Okay. Find piece of birch in scrap pile. Find brass plumbing fitting (I actually knew exactly where it was!). Take birch to shavehorse. 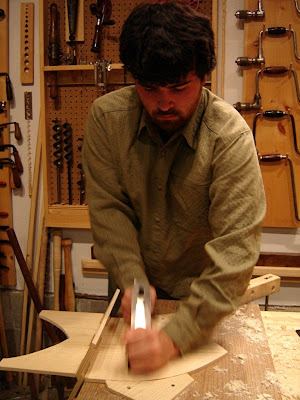 Rough it out with drawknife. Fast! 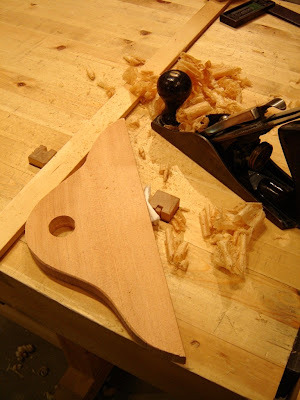 Clean up with spokeshave. Cut off with saw. 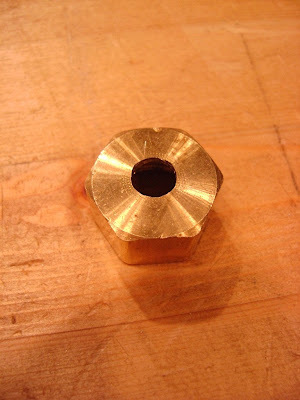 Round end to fit brass cap. 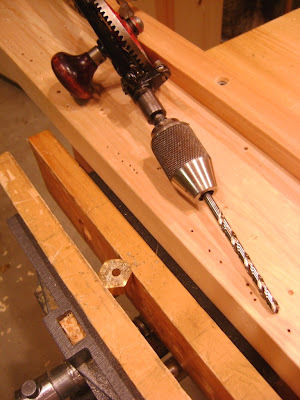 Clamp cap in vise and drill hole through for file tang. Hmm. It moved off-center. Okay. Clean up with rat-tail file. Screw onto birch handle. Clamp handle in vise. 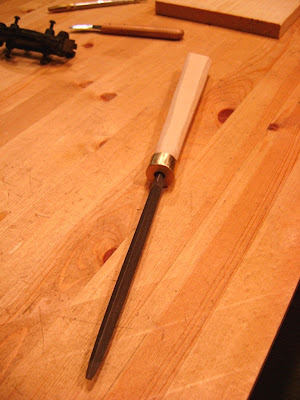 Drill two step hole for tang. Clamp file in vise, tang up. Get propane torch. Heat tang. Force handle down over tang. Pull back off. Reheat. Reforce. Whack with hammer. Done. Wait. The "nut" look of the brass bugs me. File it round. Okay. Now it's done. What was I doing? Oh yeah, ripping molding strips. Right. Need to sharpen the saw first. 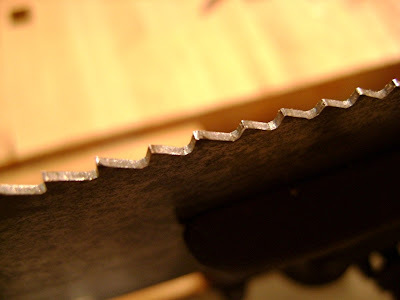 Run jointer down saw teeth. This creates small flats on top to the taller teeth. 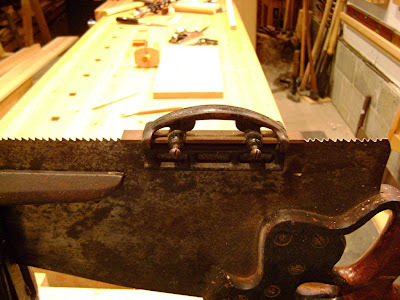 In theory, on ALL the teeth, but this saw is a long story. I bought on eBay years ago, and boy was it messed up. I tried to reshape the teeth, and didn't do half bad for my first try at that, but it's not perfect, and the teeth are only slowly becoming more uniform each time I sharpen it. Doesn't matter - works great anyway. At least when it is sharp, so back to that. Reclamp saw lower in vise, just below the gullets. File every other gullet - trying to remove half of the flat on the top of the teeth. Reverse saw. File remaining gullets. Not bad. Not perfect - but plenty good. Back to the board waiting on the saw bench. Rip. Rip! Holy smokes is it better! 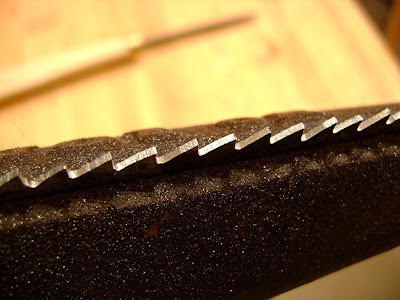 When was the last time I sharpened this saw? Rip. Rip. Done. Hmm. I wonder if I have time to clean these up with the jack plane? Look at clock. "What! How'd that happen?" Drat! Need to clean up and call it a day. "But it will only take about 15 minutes to plane those two strips..."
Okay, this was going to be my first book “review”, but it has turned out to be more of a book ramble. 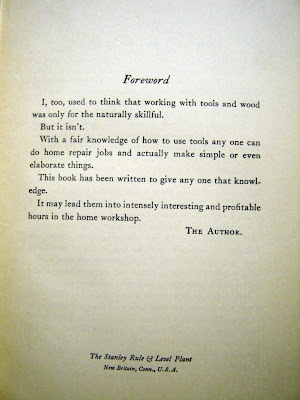 The book is How to Work With Tools and Wood: For the Home Workshop, published in 1927 by the Stanley Rule & Level Plant. 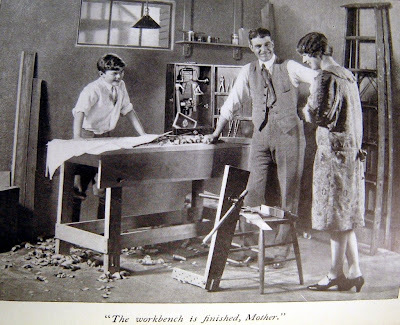 I’m sure that one of the main reasons that Stanley published this book was to help sell tools. And yet there is more to it than that. There is a lot of discussion of aesthetic, craftsmanship and beauty in here too. I’d really like to know who wrote it. This book is great for three reasons: 1. it smells good 2. it is tremendously campy and 3. it is full of great hand tool information. What can I say, I love the way old books smell (NOT the moldy ones!). For me, it is a mix of my Grandmother’s attic; the old, old books I was always shelving in Drew University’s library; and summers in Vermont, reading an old book in the sun. “The fact is that almost anything which we use can be made stronger, more simple, more beautiful, by loving hands than it can by machinery. There is no reason why a kitchen shelf may not be fundamentally beautiful. There is no reason why a door cannot be hung so that it swings at the touch of a hand and is beautiful because it is simple and rugged. “…You can go to a store and buy a candlestick complete and ready for use, varnished and polished, for from 10 cents to $5.00. You can make that candlestick yourself with perhaps no saving in money. But when you have made it and it is standing on the mantelpiece you have always before you as you look at it the memory of a sharp tool cutting into well seasoned wood. Through your hands, and your hands alone, the world is richer by the existence of that object that you can hold in your hand. Pretty deep stuff for old Stanley. It seems to me, that today, most “How To” books focus on the techniques (the actual “how to…”) and don’t involved themselves in the “Why” like this book tries to do – albeit a little strongly sometimes. 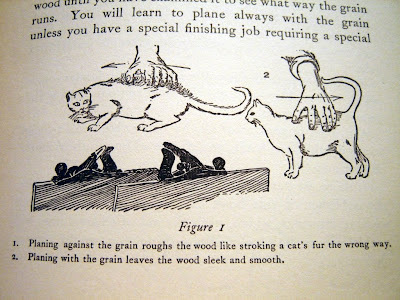 There is some very solid hand tool information. 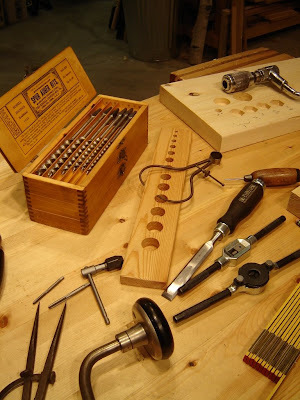 Topics covered include: a basic set of hand tools, tool chest (“…which is their respected domicile.”), bench, basic layout, hand sawing, cross-cutting vs. ripping etc., how to set and use a plane, truing up stock, boring with a brace and bit, mortising, how to bore and countersink screws, various work holding devices (including Stanley’s funky little Bench Bracket), the advantages of working from a detailed set of plans (available from Stanley…), finishing, sharpening, and several basic projects. 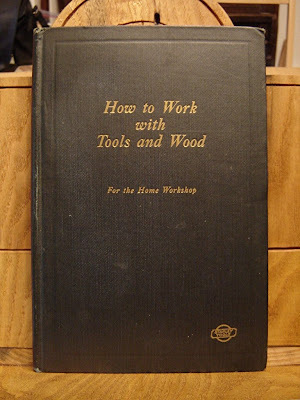 If you are interested in hand tool basics and/or enjoy reading old books, I highly recommend this book. It comes up frequently on eBay, doesn't go for too much, is full of good information, amusing photos and, at least for me, great philosophy. Well, the actual work on these projects was finished several weeks ago, but with middle school starting up again I have been very busy. Now that things have settled down to a dull roar, I can finish posting the great results of a thoroughly enjoyable pair of projects. Last time, James had successfully opened his book stand. All that remained was to shape the top and the legs and clean up the newly exposed surfaces, which were still rough from the resawing. 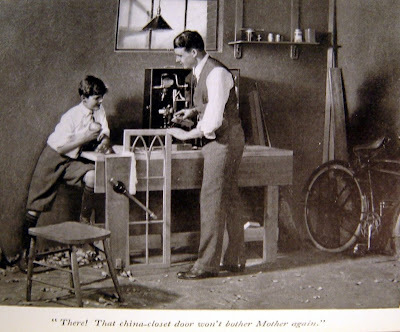 Here he is using a rasp to smooth a tricky spot, having already cut the arch of the legs with the turning saw and trued the curve with the spokeshaves. Here is a better look at how we fastened the work to the bench. You gotta love handscrews! 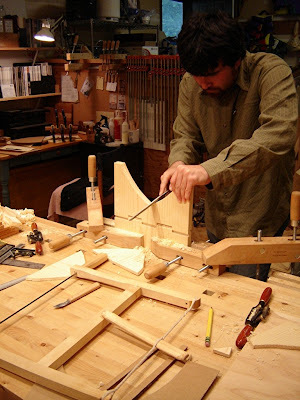 And here is the set-up to hold the work steady while he planes the resawn surfaces. Now you might be thinking, "Why didn't they do that before cutting the curved edges - wouldn't it have been much simpler?" Of course! But what you don't know, and couldn't be expected to know, is that I was only trying to make the lone, cast-off piece of mdf in my shop (part of a shelf I ripped out of the laundry closet) feel useful - its spirits being so low after it realized that it is not really wood in the natural sense of things at all, and its grain is fake to boot! So there you go, we meant to do that! Jenny had a little further to go to complete her necklace holder and ended up coming over twice. Which is just another way of saying "Twice as much fun!" 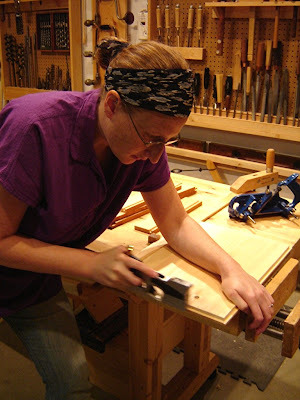 Here she is using the panel gauge to mark the panel, which she then planed down to its final width. 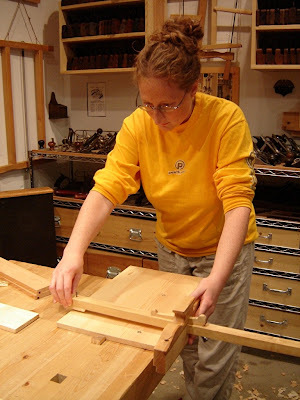 Next she planed the rabbets with the Record 778 and cleaned them up with the Veritas shoulder plane. 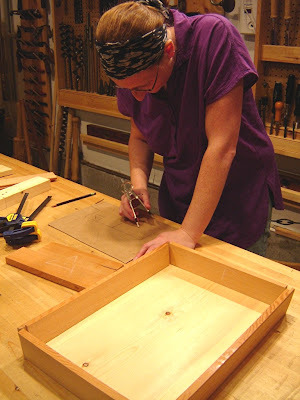 After the panel was done, the frame and panel could be assembled and glued-up. 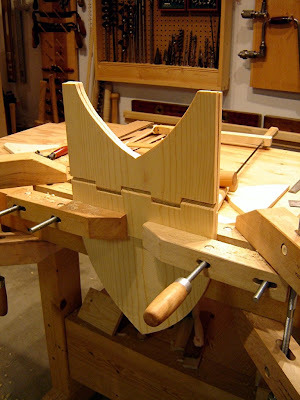 This left the pegs, which she whittled from some doweling and the curved top. The wood for the top was made by jointing and gluing together the last two scraps of the doug fir from making the frame. Jenny then designed the curve, cut a cardboard template of the shape and traced it onto the stock. 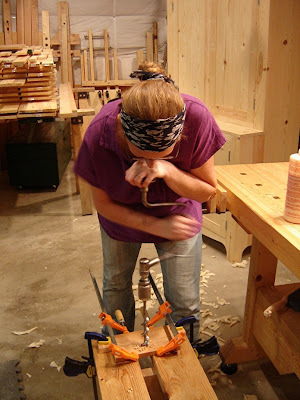 She bored the classic shaker peg hole with the brace and bit and then cut the curve with the turning saw. The curve she trued with the spokeshaves and the face of the piece was smoothed with the #3, which required another bit of creative holding. After the frame was removed from the clamps, and cleaned-up with a plane, the top was glued on and it was finished! Here are two last shots. One of both the book stand and the necklace holder. 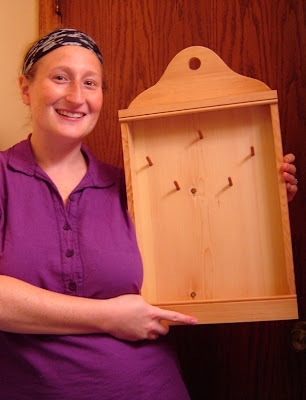 And another of Jenny proudly holding her first woodworking project! Yahoo! I am already looking forward to James and Jenny's next visit - and James' brother Kerry said something about making a cribbage board! More fun in the shop!"